Mark Goodman, Global Head of Electronic Execution at UBS (left) & Declan Graham, Head of Business Development Electronic Execution at UBS (right), discuss best execution and other factors fuelling the increased adoption of execution algorithms in the foreign exchange market, as well as outlining the latest developments in UBS’s FX algo business. The use of execution algorithms in the FX market has risen significantly in recent years and research reports predict this trend is set to continue. What are the main factors driving the increased demand by market participants? Mark Goodman: One of the main drivers for our client base is the need to justify the decisions they make when trading, and it is telling that the rise in the use of FX algos has been accompanied by a rise in the number of third party TCA providers. 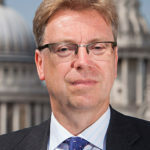 Not only do our clients want to be able to use new innovative ways of execution, they want to use them in combination with the ability to evidence that their decision to use them was the right one: whether that is deciding to use an algo versus a more traditional risk price, an algo from one provider versus another, or deciding between two different algos from the same provider. There is a core best execution theme underlying the increase in the use of algos even though, interestingly, Spot FX is not in scope for MiFID II best execution requirements. Declan Graham: We have also seen a rise on the buyside in the number of cross-asset heads of trading. Where previously there may have been individual heads of FX, Fixed Income & Equities, we now frequently see a single, global head of execution. Often they have an equities background, where TCA and algo usage are fully embedded. 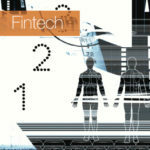 So they are looking to bring best practice from that experience into other asset classes. 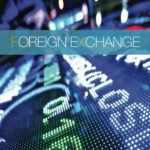 Another factor is the rise in the number of new liquidity providers in the FX market. Clients are keen to access that liquidity, but they want technology to be able to access it in an intelligent way, and this is certainly a space that FX algos can help navigate. What, typically, do your clients ask for from your FX algo business? Mark Goodman: A challenge for brokers is that clients aren’t all asking for the same thing. Clients use different algos depending on their trading style. Where commonality cuts across is in liquidity. As clients can usually access the same breadth of liquidity from one broker to the next, the conversation over the past year has tended to focus on: how do you manage your interaction with that liquidity? How do you manage challenges such as last look versus firm liquidity? How do you manage the challenge of executing across several ECNs and finding that, as you start to do that, liquidity from other ECNs disappear and the price moves against you? These are very detailed questions that our clients are asking now, compared to the initial adaption period for FX algos. What direction is UBS taking with its suite of FX algos? Declan Graham: We approach algo development from two sides: micro, which is the liquidity interaction common across all algos, and macro, which focuses on the behaviour of the algo itself, whether that is passive, aggressive or liquidity-seeking. At the micro level, we wanted to solve for customers the same problems that our own position traders had been facing – essentially, how to increase their hit rates. On the macro side, our focus has been on characterising individual currency pairs to a level of detail that allows each algorithm to be very precise in its behaviour. For example, we are not just looking at the average spread for a particular currency pair, we are looking for example at the average spread each second of the day, and the average spread by second on a Monday versus a Tuesday, or on a Non-Farm Payroll release day versus a US holiday. This is where we have deployed machine learning techniques to handle very large data sets and make the macro behaviour of the algorithm much more precise than it would be using more traditional quantitative methods. Earlier this year, UBS launched ORCA-Direct. Can you talk about the logic behind the algorithm and the scenarios in which clients should consider deploying it? 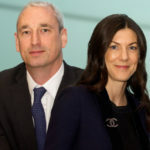 Mark Goodman: The first manifestation of UBS’s development in the micro area has been ORCA-Direct, an algo designed to increase capture rates. The first thing we looked at was making sure we were connected to a broad range of liquidity and that we proactively curate the liquidity on offer there. Second, a timing algorithm was developed to tackle the problem of lifting an offer on one ECN and seeing the price move against us on all the others. UBS carried out a lot of analysis around how we locate our infrastructure and release orders to the market so that we could reduce the probability for liquidity to disappear from us when we are trying to interact. The third element was last look versus firm liquidity and better understanding not just the absolute price that we can see in the market, but the probability of trading that price and adjusting the algo’s behaviour to take into account both price and probability. When we combine these elements, clients can often get a much better outcome. They are not just getting the best price; they are getting a high certainty, which increases their hit rate, meaning they go back to the market less often. Our hit rates have increased from 50-55% to approximately 80%. ORCA-Direct was designed initially for our Principal traders and was made available this year to our clients wanting to get a large amount of liquidity done with a fairly high urgency. 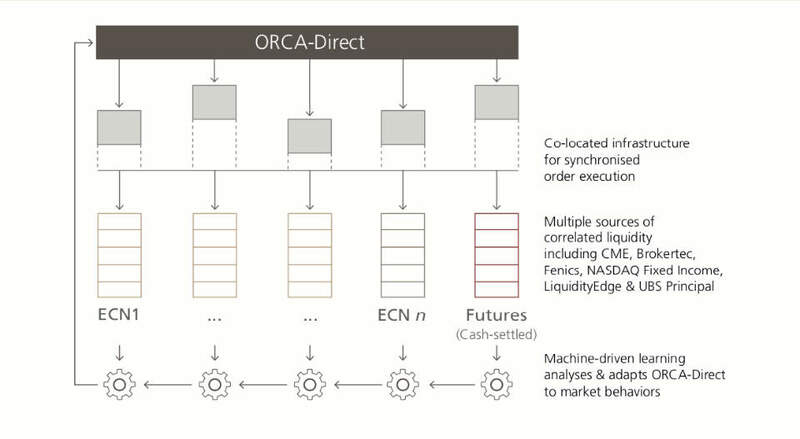 It tends to be used by other banks and hedge funds, but we have applied that same logic at the micro level to our other algos, so that even a fairly patient trade like a TWAP over a four-hour period can send a small slice into the ORCA smart order router, and ORCA will intelligently interact with the liquidity to get it done. Looking ahead, is it likely that the traditional reasons for using FX algos, such as liquidity access and minimising market impact, will be overshadowed by regulation? Mark Goodman: While regulation tends not to be prescriptive as to which solutions clients should use, there is ongoing, and likely-to-increase, regulatory oversight on whether market participants are getting the best outcome, which means clients will use a range of tools at their disposal, of which FX algos is a key one. Straightforward risk pricing is another, and the balance between the two will change depending on the client. We don’t think the reasons will change because of regulation unless we see real pressure on balance sheet usage and on the ability for the market to provide liquidity, which we do not foresee in the short-to-medium term in FX. 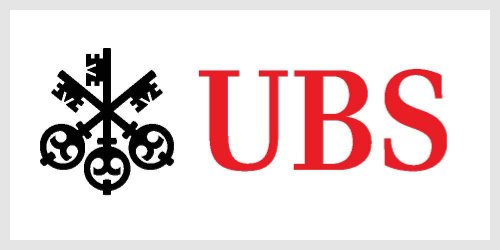 What is in the pipeline for UBS’s algo product suite? Declan Graham: We currently have five core FX algos but are looking to add one more in early 2019. Client feedback has been consistent in a desire to have access to a relatively limited but well-defined suite of algos. Our new algo is designed to target the Daily Fixing, a period of the trading day which is obviously quite idiosyncratic in terms of volumes. Our use of machine learning to better inform algo behaviour is ideally suited to targeting this very data rich trading period. Given the overall size of UBS’s FX franchise, this data-centric approach to algo development, underpinned by machine learning, means we are in a perpetual cycle of improving the performance of all our algos.